For the copyright issue of many websites of the emerging markets that often have to subscribe and pay to download resources, downloading videos or music can be a hard process full of constant interruptions. Considering you can’t always be connecting to WIFI, and the fluency can’t be guaranteed either, an excellent downloader is quite essential. InsTube is designed to make it a primary downloader for its users. A combination of factors makes it a great choice for you. Let’s look at this App in more depth. 1. As many sites as you expect. The sites included by the downloader will directly decide your scope of exploration. Therefore, the number of sites and the popularity of them should be first taken into consideration. 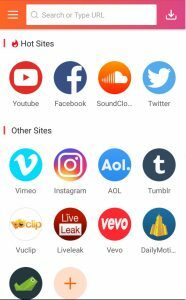 InsTube supports a large number of sites, among which the hot ones like YouTube, Facebook, Twitter and SoundCloud etc, are all included. To be convenient, you can find them on the homepage easily. 2. Why not choose a 4K HD video? InsTube provides kinds of formats for downloading. What a pleasure it is to enjoy a 4K HD movie as soon as you like. Yes, why not enjoy the best one since you have the choice. Among other things, the converting function inside it makes InsTube a more powerful app. Why bother to download the music format as you can convert it to MP3 on the go. Let’s take a video downloaded from YouTube as an example. Find the video and tap on it, choosing “play as music” in the page popping up. This function also satisfies a large number of people who bother to convert a video to MP3. You may like to download some videos or music in a place with WIFI service for offline viewing while you are commuting or waiting in an area with limited connectivity, or you may go to such a place particularly to do that. At this time, InsTube, with its high speed and multiple threads, comes to your rescue. It allows to download many videos at the same time, and all is done with multiple network connections, which both saves your time and cheers your mood. InsTube is designed to be safe and considerate. Considering the users’ privacy, InsTube provides the function of hiding your videos or music, etc. There is no doubt that security is almost the first thing that users concern. 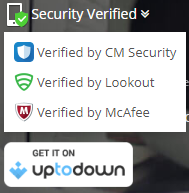 InsTube is verified by Lookout, CM Security and McAfee and it’s virus and malware free. Then, Let’s take another video download App, SnapTube, as an example. 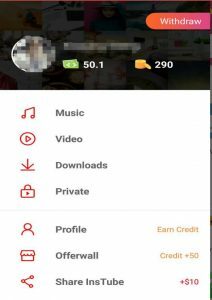 according to the analysis of SnapTude security, one can find SnapTube requires more information than it needs, which is one of the methods to prove whether an App is secure or not. InsTube also comes with the Offerwall to enrich users’ experience feeling, in which the credits you earn can be used to exchange balance. You have many ways to achieve that, for example, sharing the App with your friends and finishing the daily task. Furthermore, users will get 50$ as soon as they sign in. InsTube would increasingly try to support more sites and improve user experience. If you are primarily an Android user, InsTube is arguably your great choice to download videos and music. You can search InsTube in your phone directly, or you can go to our official website to download it.